As you push your limits in the great outdoors, the gear you need to go further advances in stride. While trekking poles were once an underutilized asset, they’ve since transformed into a necessary tool for hiking and mountaineering. Trekking poles supplement the forward momentum of your body and attribute to increased speed and performance on flat ground or slopes. They reduce the impact accrued on leg joints, assisting in healthier exercise, especially when going downhill. Using trekking poles also helps you maintain traction on slippery surfaces, navigate stream crossings, and push back bushes and brambles blocking your path. The increased balance poles provide enhances your outdoor experience, allowing you to better soak in your surroundings. Want to get really creative? Use your trekking poles in place of tent poles to pitch a shelter and save weight on expeditions. Whether you’re going for an afternoon romp or a lengthy backcountry adventure, here are some of the best trekking poles you can buy. 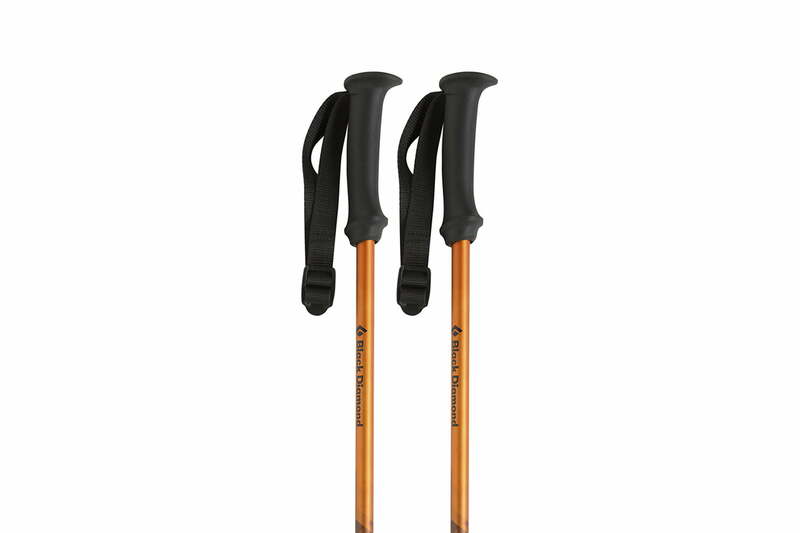 There are two different kinds of trekking poles: Standard and shock absorbing. Standard poles can either be folding or telescoping and are typically lighter than shock absorbing poles. Standard poles also offer two different kinds of locks, lever locks or twist locks. Lever locks are ideal for use in any condition while twist locks are best for warmer weather when you don’t have to adjust them with gloves on. Standard poles are available in either two or three sectioned designs, with the two sectioned poles being sturdier and the three sectioned poles being more compact and ideal for backpacking or long-distances. Shock-absorbing poles contain springs that can be compressed to relieve ground impact on your body. Some shock absorbing poles allow for the mechanism to be locked so that it equally functions as a traditional rigid pole. This relatively new technology is ideal for trekkers with joint sensitivities or for use on extremely uneven terrain where added balance is an asset. The downside of shock absorbing poles is their relatively heavier weight due to the added material. Most trekking poles are designed with either an aluminum or carbon fiber shaft. Carbon fiber is the ideal choice when weight is a concern due to its ultra-lightweight construction, though aluminum shafts are much more durable. Carbon fiber bends under extreme stress whereas aluminum is more structurally resilient. For long-distance backpacking, carbon fiber is the better choice whereas aluminum is ideal for mountaineering. The grip is perhaps the most important aspect of a trekking pole, as it is the point of connection between your body and the earth. Trekking pole grips are constructed of either rubber, foam, or cork. Cork grips are ideal in terms of comfort, as they mold to your hand over time, provide breathability in warm conditions, and a degree of insulation in colder weather. Rubber grips are the best insulator, serving as effective vibration reducers, while also resisting moisture retention. 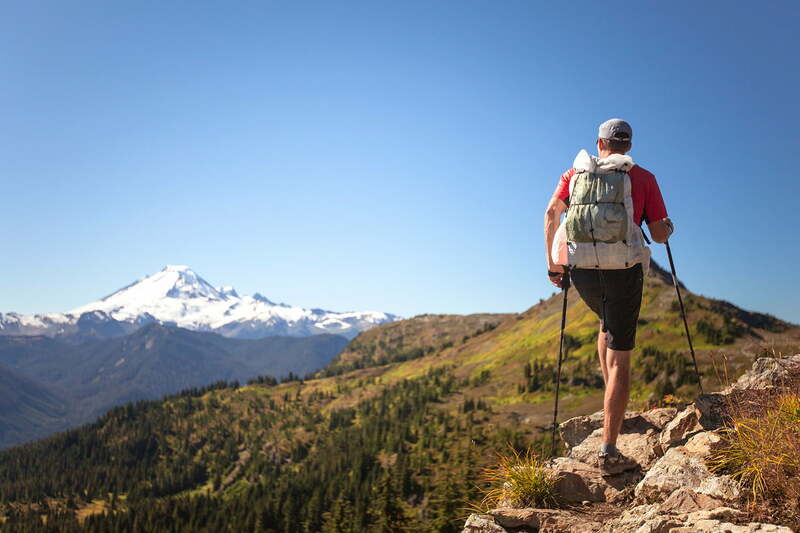 Foam grips are ideal for warm weather hiking as they provide for sweat absorption, a lack of slippage, and the reduction of hot spots from friction build-up. These premium trekking poles feature everything you want in terms of comfort, performance, and durability. At only 17 ounces, you won’t have to worry about elbow pain or wrist discomfort on longer treks. Carbon fiber construction in all three sections ensures long-term durability and the cork grips are molded for comfort. Whether you’re setting out on an alpine route or an extended backcountry trek, the Black Diamond Alpine Carbon Cork poles are sure to exceed your every expectation. These poles feature non-slip EVA grip extension, dual FlickLock Pro adjustability, and interchangeable carbide tech tips, trekking baskets, and powder baskets for true all-season performance. The thick pole diameter may not make for the most lightweight construction but offers unsurpassed reassurance when navigating tricky terrain. 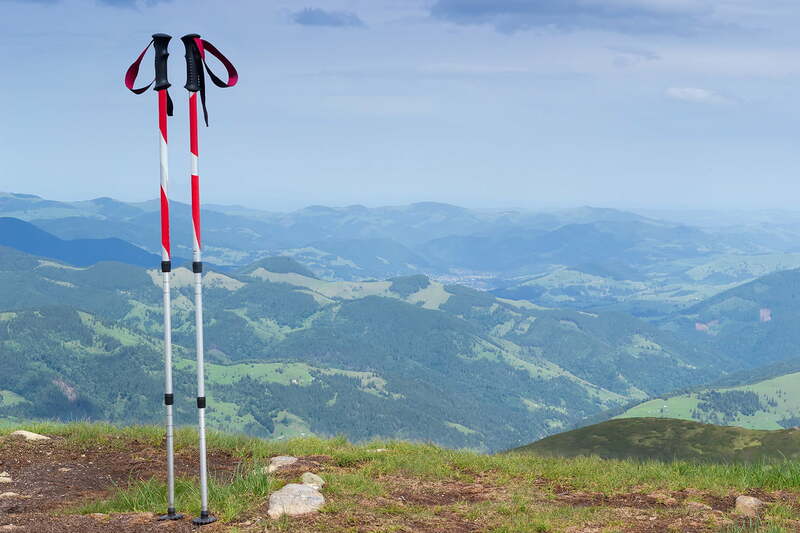 Although these poles lack an anti-shock mechanism, trekkers will hardly notice, even on the roughest of trails. When you’re counting every ounce, the Gossamer Gear LT4 is an ideal trekking pole selection. At an astounding 9 ounces, arm fatigue is minimal even after countless miles, making them perfect for long distance expeditions. The LT4 features a simple, yet reliable build and comfy EVA cork grips. Although they do not include wrist straps, the LT4S version features the same model with wrist straps for just $15 more. Adjustment is easy, as well, requiring the tip section to be slipped into the grip section and twisted until snug. Carbon fiber construction provides for the ultimate strength-to-weight ratio, ideal for thru-hiking and long distance treks. It’s recommended to stick to established trails with the LT4s as they are not the most durable models on the market, but their unsurpassed weight advantages should appeal to those who want to travel fast and far. If you prefer the newer folding style of trekking poles over the traditional telescoping kind, the Leki Micro Vario COR TEC is an ideal pick. This product features a large, rounded top that’s perfect for those who tend to palm the top of their poles. Not only are these trendy but they’re also one of the most comfortable models on the market. The Leki Micro poles are made of Aergon CorTec cork material designed to minimize discomfort while providing for just the right amount of grip. A push button mechanism allows for ease of assembly and efficient length adjustment. The aluminum material makes for a durable product and the flex short tip provides for precise grip on any terrain. These poles are designed with the Leki skin strap, an ultra-lightweight strap that maintains comfort in any backcountry conditions. The only downside is a slightly heavier weight at 18.5 ounces. If comfort is your primary concern when selecting a pair of trekking poles, the Leki Corklite will exceed any and all expectations. These trekking poles boast the most comfortable handle design to date, comprised of the edgeless Aergon CorTec Compact grip. Ergonomically crafted angles provide a slightly forward tip for increased balance on the most uneven terrain. The handle is extremely water-resistant and boasts a smaller diameter grip overall. Additionally, the wrist strap wicks moisture and dries quickly. The Leki Corklite utilizes the Speedlock system, which is an external lever lock that supports up to 192 pounds. Aside from their unsurpassed comfort, these trekking poles are noted for their excellent durability, attributed to a wider diameter shaft and aluminum construction. These poles inspire confidence both on and off the beaten path. Shock absorption is relatively new to trekking technology and provides poles with extra give when traveling across brutal terrain. Although heavier and more complex than most models, a shock absorbing system provides for excellent impact dampening — with every stride. The Black Diamond Trail Pro Shocks are remarked for their performance as they bottom out much less than other comparable models, regardless of the amount of impact. This product also features Black Diamond’s FlickLock Pro construction, providing for ease of use and excellent durability. Although this product is heavier than many others on the market weighing in at 20 ounces, for a product with shock absorption capacity, it is on the lighter end of the spectrum. Although the handles are made of foam as opposed to cork, they are still fairly comfortable poles. If you often trek with your family and your little one is old enough to keep up, why not get them their first set of trekking poles? Since kids have shorter legs, they may have a harder time crossing technical terrain — and a set of trekking poles would work wonders for them on the trail. In addition, they’ll help stabilize them and keep them from falling, while also teaching them an essential hiking skill. Black Diamond’s First Strike poles are ideal for kids thanks to its FlickLock technology, which allows the trekking pole to grow as your kid grows — or even as the terrain requires. FlickLock technology provides visual assurance that the two-part trekking pole is locked and ready for trekking, which is great for relieving any parental stress associated with a possible fall from a collapsing pole. The rubber grip is sized for small hands and a steel safety tip ensures no accidents occur. The pair comes with regular trekking baskets and winter freeride baskets for use in all seasons. The First Strike poles extend from 26 inches to 43 inches.